Are you ready to nestle yourself and your mate into a cozy environment surrounded by the beauty of nature? 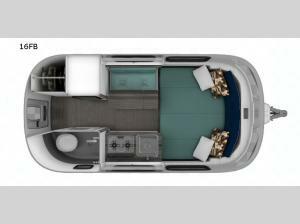 With this Airstream Nest travel trailer you can. You will love the six side windows, skylight, and vertical window on the rear entry door to bring in tons of natural lighting, plus a great view of your surroundings. When you need a bit of privacy you can easily draw the blackout shades closed. A 58" x 80" queen bed is ready when you are for a welcome slumber on the Tuft & Needle foam mattress provided. When you wake in the morning you will find the rear corner wet bath a welcome space to get refreshed and ready for wherever your day takes you. Whipping up a favorite meal or snack is also easy with the kitchen amenities provided. You will enjoy a 3.2 cu. ft. refrigerator, a two-burner cook-top, and microwave oven. This unit also provides ample storage throughout.